All of our body’s movements are performed through a system of pulleys and levers; your arms and legs are complex machinery, but they move under basic principals of physics and gravity. Front levers and back levers are an exaggerated example of that. What makes front levers and back levers unique is that instead of using leverage in your favor (like you do during a deadlift) you’re doing the opposite–using primarily your arms to move the rest of your body! Front levers and back levers are two challenging exercises that require tremendous core strength as well as a powerful upper-body. Practicing towards these movements can build serious strength in your arms, chest, back and abs. Perhaps more importantly, levers train you to use your muscles to work together, which is how to utilize them most effectively. A front lever involves holding your body out in a straight line parallel to the ground with your hands grasping a bar(s) or ring(s). Your chest faces upwards. Note the placement of the hands is closer to being over the hips than it is to the shoulders. In addition to thinking about keeping your abs tight and extending your back, you need to be actively pulling your hands down towards your hips, engaging your lats, triceps and chest. A pullover is a great exercise to build strength for this movement. 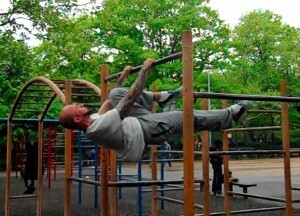 A back lever is the same idea but now you are facing downward. These are also best performed with a pronated (overhand) grip. Keeping a narrow grip is also a good idea as it allows you to leverage some of your weight against your arms. A great way to practice performing a back lever is to lower yourself down into it slowly and/or use a bent knee position to progress to the full version. As you drop into position, pitch your chest forward to wind up with your hands over your hips. Like the human flag, front levers and back levers can also be performed on parallel bars. There are subtle differences between the two that I encourage you to explore for yourself. Also, remember that levers can be easier when using a bent knee position. Performing a front lever with a split-legged position or with just one knee bent also works as a great variation on the way towards the full lever position. Experienced trainees might want to challenge themselves by practicing towards a one arm lever–you can always find a new challenge! it is very difficult exercise, but I try to do it! Thanx a lot for the detailed explanation! Hey Max – levers take a lot of practice, but challenges make life exciting! completely agree with you !! Besides pullovers, would straight-arm lat pulldowns also be good? Since pullovers are hardest when shoulders are completely flexed which is the beginning of the motion in a pull up or whatever. Pulldowns seem to get hardest around the middle which is where the shoulders appear to be during the front lever. The back lever is very extreme, all I can figure for that is doing dips and I guess if you were lying supine on your back on a bench with a barbell on your thighs to do a front raise motion, like the reverse of a pullover. I don’t think a cable machine is going to do much in terms of helping with a back lever. Work on skinning the cat for a while before you worry about this move. Admittedly, this tutorial isn’t one of my best. I will have a better discussion of the back lever in my next book.